It is been around 6 weeks ago. To be honest, I felt emotionally cringed and generally not in a too good shape back then. Close friends told me, that from an outer perspective this was totally understandable… . A lot was happening all at once – the third moval within a year and a sad yearday – just to name two. As cognition alone did not affect my emotions sustainably I thought of taking dedicated time to step back and reflect. To see and celebrate possible successes. To identify and prioritize possible improvement areas. To then take meaningful next step(s). Sounds like a retrospective, doesn’t it? With that an experiment was born: instead of doing just another "big" personal retropective once a year I asked myself: Why not start doing smaller retrospectives throughout the year? Six weeks ago I just started by jotting down all the good stuff (the ‘heart side’). Surprisingly I remembered a lot I normally quickly forget during the daily grind. After that I wrote down the stuff which I wanted to change and improve (the ++ side). I identified three improvement areas and chose two to approach next. To make sure I could tackle them, I added two concrete actions each to be able to check (or even: measure) progress. 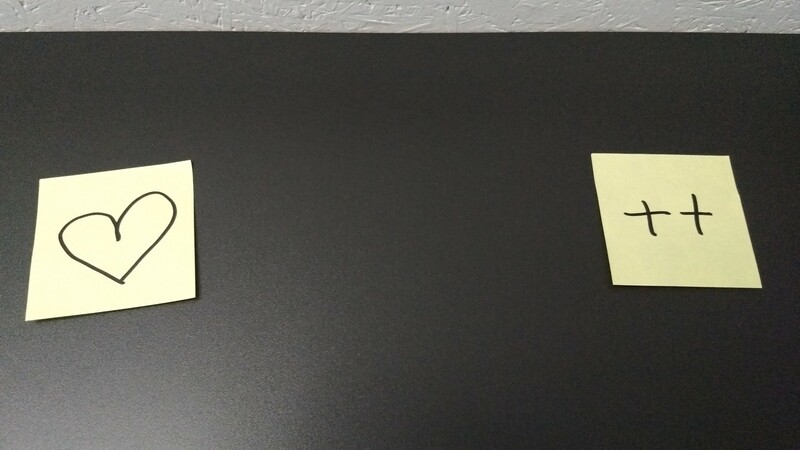 Four weeks ago, these "personal retro postits" moved first to my new home. Of course they are at a visible place to let the successes sink in more. How about you? Do you do something like personal retrospectives? I would love to hear your stories and thoughts!